Full Name, address, date of birth and join date. 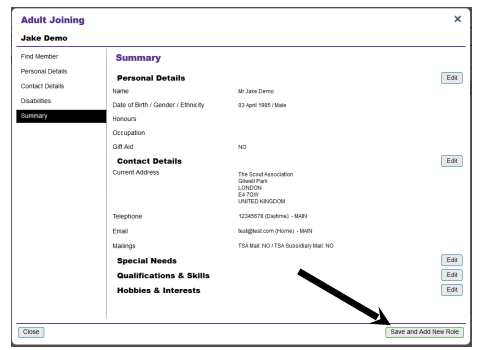 Ensure you have the correct role selected from the ‘My roles’ selector at the top of the page. (This will be the role that gives you the appropriate access rights to complete this process). Click the ‘Joining’ heading towards the top of the homepage. A menu will appear under the ‘Joining’ heading. Click ‘Add adult’. 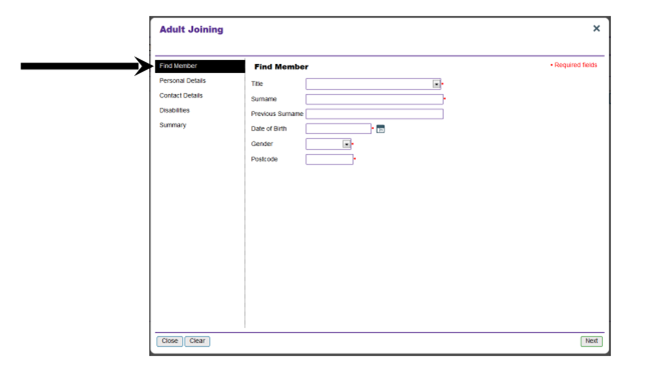 A popup box will appear titled ‘Adult joining’. There will be a list of options on the left hand side. Make sure ‘Find member’ is highlighted. If not, click on it. 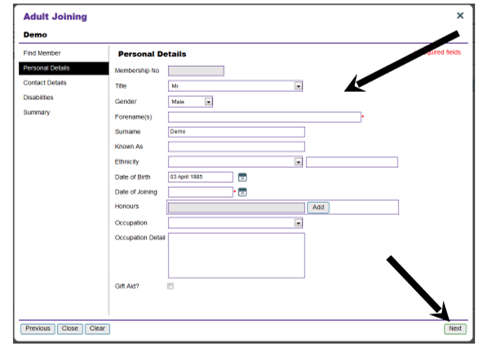 In the ‘Find member’ section enter the person’s title, surname, date of birth, gender and postcode in the boxes provided and then click ’Next’ at the bottom right of the window. You will be presented with two options; click ‘Add new person’. This will take you to the ‘Personal details’ page. Here, you will need to enter the new member’s information including their forename(s) and date of joining. You will also be able to enter other details such as the person’s occupation. When complete click ‘Next’ at the bottom right. On the following page you will need to enter the new member’s contact details. These include a home address, contact number and email addresses. For UK addresses you must use the valid UK postcode format with spaces (eg E4 7QW.) If the member you are adding lives in a country that does not use postcodes, use ‘NOPCODE’. Clicking the magnifying glass icon next to the postcode box will provide you with a list of addresses linked to that postcode. Click ‘Select’ for the address you want to use, which will then fill in the address boxes automatically. Once complete, click ‘Next’ at the bottom right to move on. The following page will let you add details of any additional needs or disabilities. 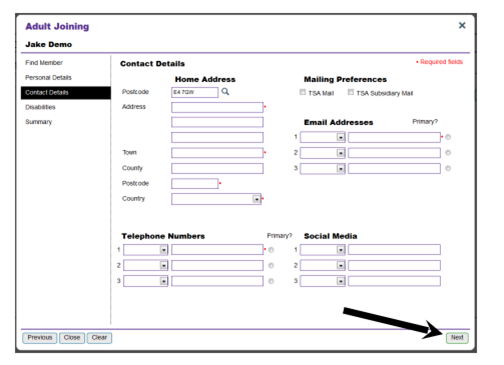 The drop down menu can be used to add the relevant additional need or disability, and any extra information can be added by typing into the ‘Details’ box. The ‘Summary’ page will display all the information provided within each section under the relevant section heading. If you want to change any of the information within a particular section, click the ‘Edit’ button next to the section name. When you are ready to add the adult member, click the ‘Save and add new role’ button at the bottom right of the window. 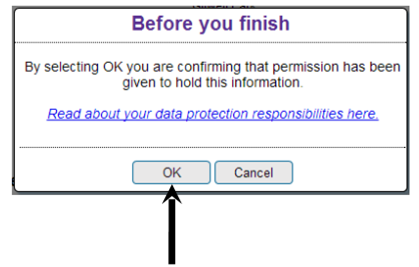 A pop up window will appear asking you to confirm that permission was given for The Scout Association to hold the information provided. Click ‘OK’ to continue adding the member. 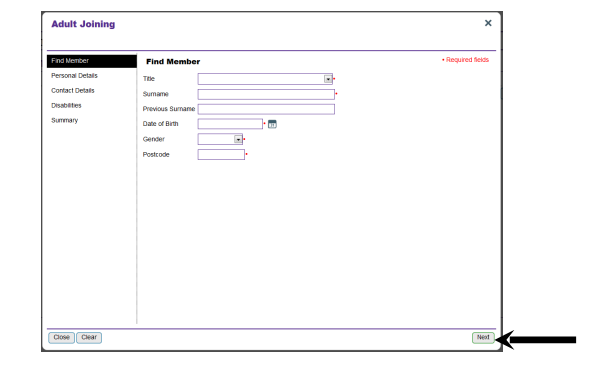 The ‘Assign new member role’ screen will automatically appear. Please refer to the ‘Adding a new role to an adult member’ user guide, from page 4 onwards. Please Note: If a member role is not assigned at this point and you leave this screen, you will not be able to find the member again, as they will not have a role in your hierarchy.